(Phys.org)—Physicists have demonstrated a new mode of electromagnetic wave called a "line wave," which travels along an infinitely thin line along the interface between two adjacent surfaces with different electromagnetic properties. The scientists expect that line waves will be useful for the efficient routing and concentration of electromagnetic energy, with potential applications in areas such as integrated photonics, light-matter interactions, and chiral quantum optics. The researchers, Dia'aaldin J. Bisharat at the City University of Hong Kong and the University of California, San Diego, and Daniel F. Sievenpiper at the University of California, San Diego, have published a paper on their demonstration of line waves in a recent issue of Physical Review Letters. "They are the first electromagnetic waves that are found to be guided by an infinitesimal, one-dimensional object," Sievenpiper told Phys.org. "The waveguide is nothing more than a line, which is an interface between two adjacent sheets or planes. This also leads to a very high field concentration, and the electromagnetic fields actually have a singularity at the line, meaning they approach infinity in the mathematical limit. Of course, in real materials with finite thickness, the fields cannot be infinite, but they can still be very highly concentrated." As the physicists explain, the new electromagnetic line waves are reminiscent of electromagnetic surface waves, which occur at the interface between two different types of surfaces laid one on top of the other. Surface waves can be used to strongly confine and guide light, making them useful for energy transmission and communication applications. Line waves are similar to surface waves in that they are also confined to the interface between two surfaces, but with line waves the surfaces are laid side by side, restricting the interface to a line. The key to realizing line waves is that one of the surfaces is inductive while the other is capacitive. Whereas the inductive surface supports transverse magnetic polarized waves, the capacitive surface supports transverse electric polarized waves. When the two surface types are placed side by side, these two different boundaries support line waves at the interface. Another important feature of line waves, as the physicists explain, is that they naturally prevent backscattering. "Line waves also have another special property, which is that opposite polarizations can only propagate in opposite directions," Sievenpiper said. "This means that defects in the line cannot scatter waves back toward the source, so this type of waveguide naturally prevents unwanted reflections. This is similar to the recently developed photonic topological insulators, but line waves have some advantages such as broader bandwidth, and they allow simpler fabrication." 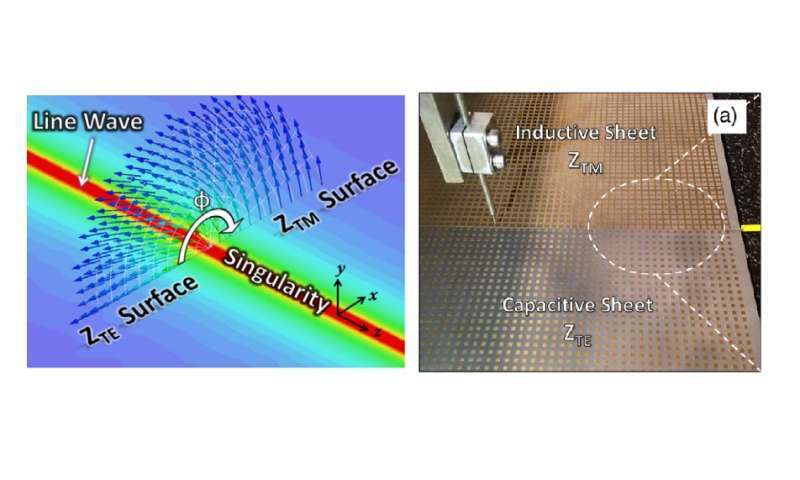 The scientists demonstrated line waves in experiments and simulations by using periodic metasurfaces, and they expect that they could further increase the operating range by using other materials. One possibility is graphene, which can be designed to be either an inductive surface or a capacitive surface depending on its doping level. 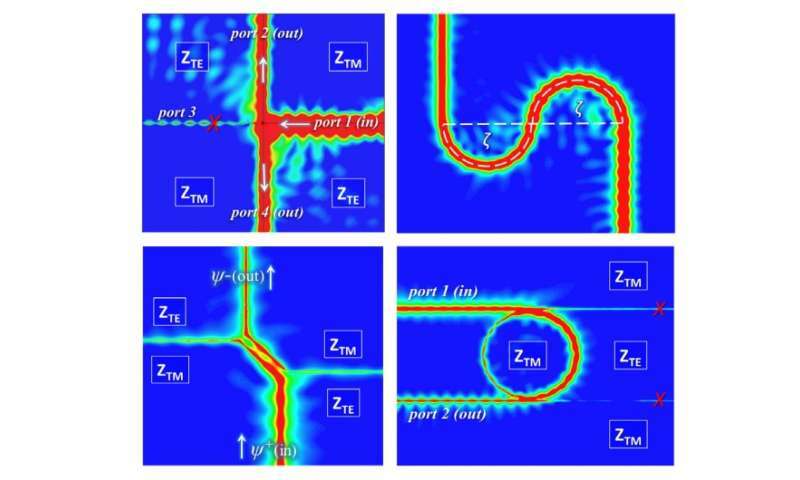 To demonstrate the control of line waves, the physicists showed in simulations how line waves can be guided along curved paths and routed to make sharp turns. This ability to confine and transport electromagnetic energy in a controlled way will likely be useful for building network devices and integrated photonics applications, which the researchers plan to further investigate in the future. "Line waves can be used for integrated optical waveguides, for example," Sievenpiper said. "Their high field concentration may allow for higher performance optical modulators or sensitive chemical detectors. The fact that they support one-way propagation with negligible backscattering may enable optical isolators or circulators. If made using materials such as graphene, line wave guides could be electrically reconfigurable, leading to field-programmable optical circuits." In the future, the researchers plan to work on realizing these kinds of optical circuits. "We are starting two new projects based on line waves. The first is to scale them down to optical frequencies and demonstrate photonic components such as isolators and modulators with better performance than their conventional counterparts. The next step after that would be to build them using tunable materials to make reconfigurable optical circuits. "We are also starting a project to extend this concept from the electromagnetic domain to acoustic or phonon waves, to enable materials with new properties for controlling vibration, sound propagation, and heat transport." Perhaps a line laser could be made with quarter wave reflectors at the ends. Alternatively, the lack of backscattering in counter propagating beams may be useful for building a ring laser gyroscope. A given polarization propagating in only one direction would require changing the polarization at the reflectors for the laser to work. But you raise an interesting case - the light would not normally be absorbed by the reflector, and it can't pass through due to the destructive interference of the quarter-wave reflector, and can't reflect because it can't go backward along the line, and it can't leave the line because it is confined to the guide line... so it would either have to couple into some plasmon escape route, or be absorbed in spite of the normally non-absorbing material... well worth trying to see what happens!